Property Size 3,475 sq. ft.
Beautiful 5BR 6BA waterfront home in Tan Tar A Estates with hot tub, boat dock with a 10x24 slip, screened in and open porches with a gas grill, not to mention a plasma flat screen in the suite and Jacuzzi tub in master bath. This place is has all the bells and whistles. 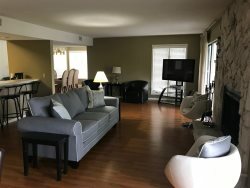 Fully stocked kitchen, fireplace in the living area, washer and dryer for your convenience, cable TV and wireless internet included.There is a King bed in the Master Bedroom, and then 2 Queens in each of the remaining 4 bedrooms. Each room has its own full bath. This home sleeps 18 guests. Tan Tar A Estates offer two outdoor swimming pools, lake access and Hidden Lakes Golf Course running throughout. The Resort offers an Indoor Water Park, several Restaurants & Lounges and Specialty Gift Shops which adjoin the Estates. Lots of possibilities with this home! Love this home but don’t need all 5 bedrooms? Call 573-964-5397 for Single Room Pricing!